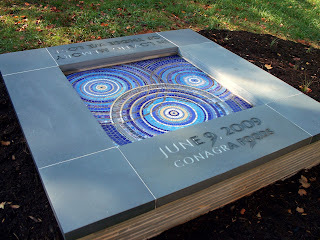 I am honored to have been a part of creating this Memorial at White Deer Park in Garner, NC. It is a tribute to the community of Garner, and the tragedy of the explosion that happened at the ConAgra Foods plant there in 2009. 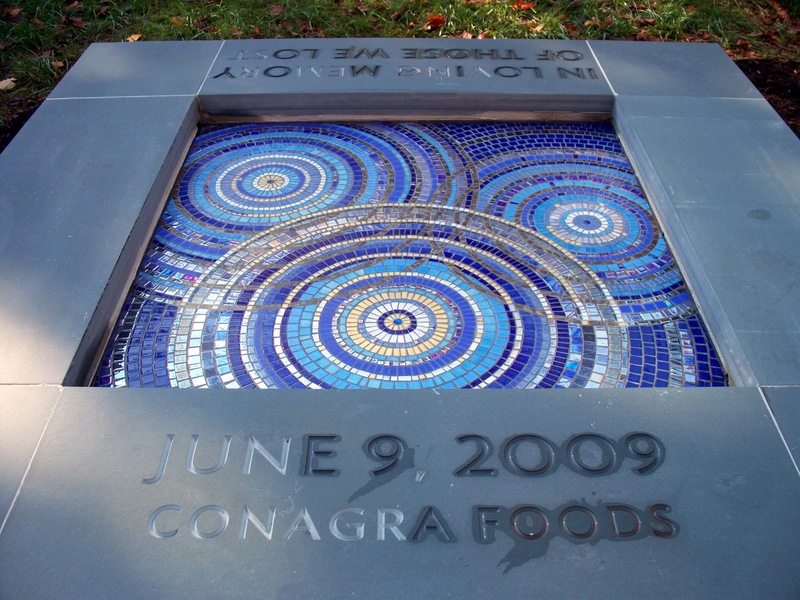 The mosaic work is 4'x4', 100% recycled glass tile which depicts a reflection pool with ripples in remembrance of the three ConAgra employees that perished that day. This past Spring, I accepted an invitation to form a small support group of fellow artists who all share a common theme of creating art that uplifts and connects. We are called the Durham heARTists. My friends in this supportive network are Beth Palmer, Steven Ray Miller, and Eleatta Diver. We had a debut group exhibit in July at Golden Belt Studios, in Eleatta's wonderful studio space, where she has showcased her fantastic "Durham Dreams" series. This past week, Beth, Steven, and I were able to take our work on the road to the Raleigh Convention Center for the "Speaking of Women's Health" conference. It is our belief that uplifting, joyful, and inspiring art has a healing effect, and the practice of creative arts helps keep a person's soul, mind and body in a positive state. 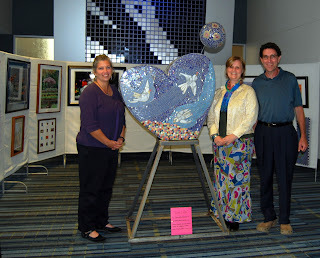 We met some incredible folks at this exhibit, and I was delighted to share my latest mosaic sculpture, "Love Lifts". This sculpture is suitable for outdoors or in, and primarily made with recycled glass tile. The inspiration for me was the supportive spirit in which our group was formed, and the common goal of creating and sharing beautiful art that instantly connects us. Thank you friends, for your wonderful art as well as your kindred hearts. This sculpture has been clear in my mind from the start. A small group of 4 artists in Durham started meeting in the early spring, sharing art that is uplifting and inspiring and not necessarily full of angst and dark undercurrents. While discussing our various strengths and weaknesses, as well as skills, this sculpture popped into my mind. I had completed it in July, then promptly crashed it on the eve of it's public debut. Note to self, don't try to move heavy objects over garage threshold alone. 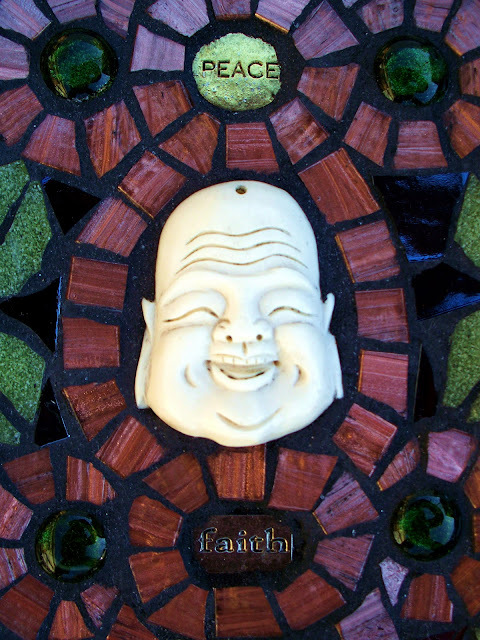 It needed mosaic repair, although the form was undamaged. The original repurposed scrappy TV stand was unusable. Fortunately a friend is an engineering/mechanical/fabricating wiz and was available to make a new, improved, stable stand for my piece. Now, it's ready to show this week in Raleigh at the Convention Center Wednesday night for the Speaking of Women's Health Conference. I'll be there with my 4 friends, showing uplifting, beautiful art. Certainly there is a place for all types of creative expression, I just prefer to create work that everyday folks can look at and connect with in a positive manner. So,go right ahead and call it happy, pretty, neat, cool, joyful, fun, lively, colorful. I'm totally fine with that. 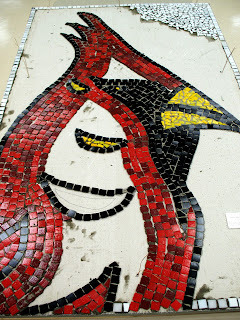 It still is a bit daunting, even almost 10 years later, to spend hours creating a mosaic, then smear cementitous grout all over it. Even though I know it will come off. To make it more of a special occasion, I like to think of it as 'grout day', something to look forward to, celebrating the end of a project and seeing it's final outcome. 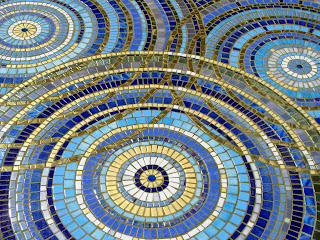 Usually it does match up with the original mosaic in my mind, but doubt is often lurking. Today was 'grout day' for one of the Elementary mosaics. So, I didn't lay the mosaic tiles, but did put in hours of designing, planning, and facilitating 5th graders in the making of this cardinal mascot panel. They did a great job, and grout day was a fun opportunity to get my hands dirty on this one, literally. Back in Durham now... trying to avoid unpacking the van. Had a great workshop with some fun and interesting folks. And met plenty of new friends taking and teaching other wonderful classes this week. 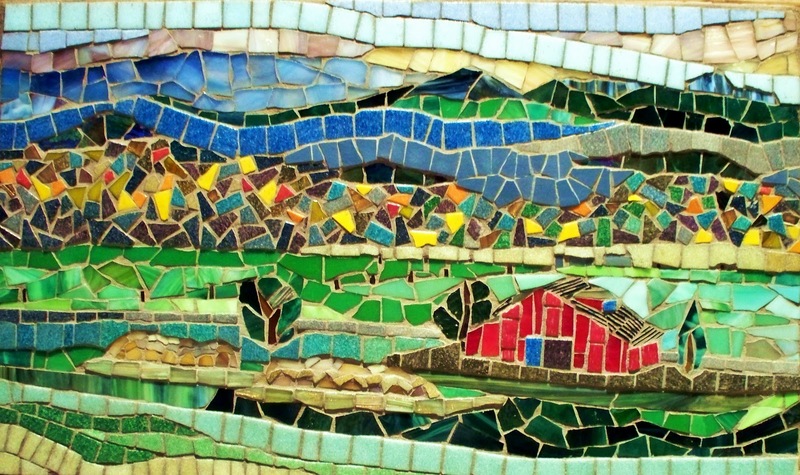 This mosaic wall hanging, "Down The Hill" will be available at the John C. Campbell Folk School's upcoming Blacksmith's Auction Event. 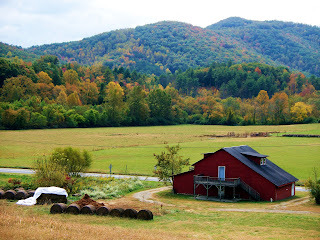 If you've been to Brasstown, you know this vista as the gorgeous view from Orchard House (down the hill, yes, I admit I'm not very creative with titles). Please support the Folk School in any way you can--- take a class (weekend and weekly offerings), send in a donation, check out the website or catalog and pass the info along. This type of learning environment is unique, and special in so many ways. I'm already looking forward to my next visit in April 2012. It is work. Really. 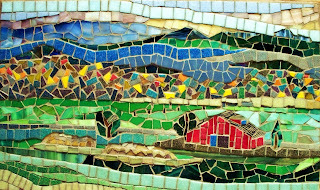 I'm back at John C Campbell Folk School, teaching mosaics this week and it really is work. The temps are just right for early fall, the leaves are beginning to turn, the home style cooking is lipsmackin' good. I have 5 students this week. Today they all completed a reverse cast stepping stone of their own design. 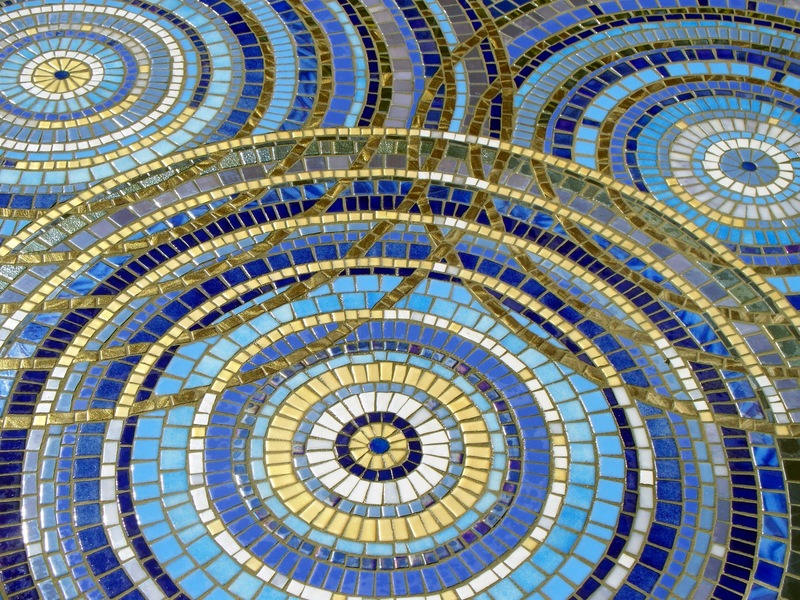 Tomorrow they will be starting on a more intricate mosaic panel. Have I convinced you yet that it's work? I don't have to make my bed (unless I want to), I don't have to transport, cook, clean... I'm in a beautiful rustic mountain setting with wonderful people. Ok, it's a vacation... with a pay check at the end of the week. I highly recommend it. Kids are pretty amazing. 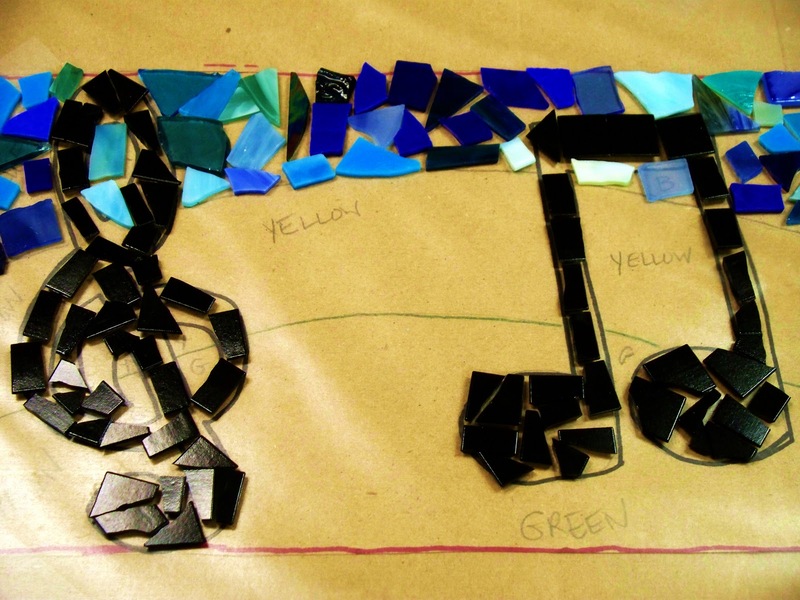 This week I'm facilitating mosaic projects with students at 2 elementary schools. Did I mention they are totally different projects? Not only are they different designs, but also materials, methods, and eventually installations. The things that are the same are the excited faces and eager hands of the students. One school I go to in the morning, and work with 3rd graders. They have a border-like pattern that includes musical notes on a blue, yellow, and green rainbow background. The Monday class completed the black musical notes, the Tues class did the blue stripe. Tomorrow is yellow, Friday, green. 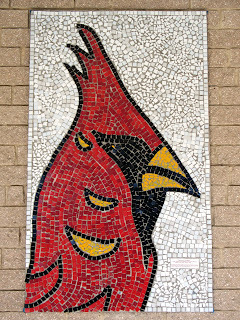 The mosaics will be secured with tile tape, then I'll install on the interior of the school at the end of the month. At the afternoon school, I'm working with 5th graders to complete this 3x5' panel which will be screwed into the covered masonry wall at the entry of the school. 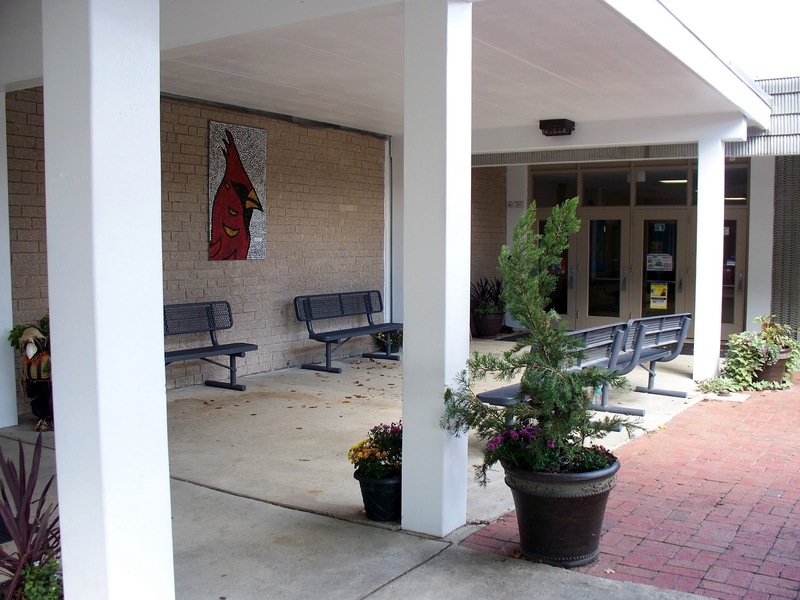 The cardinal is their school mascot. So far, so good. Anticipating a couple of very busy weeks ahead.... being prepared, and having a backup plan is usually the key to success with my projects. Especially working with children. I'll be facilitating mosaics at 2 elementary schools this week, one in the morning, one in the afternoon. Rotating classes Mon, Tues, Th, and Fri. Each project different in design as well as materials and methods. Gotta be prepared, and gotta have a backup plan (in this case, two). Meanwhile, gathering and packing for my week teaching grownups at the John C Campbell Folk School starting Sun Oct 9. And as most of you know/do yourself... balancing the family requirements, activities, and chores... So, my Sunday tidings are peace and faith for the days ahead, for my self and all of you.